There are many tools available that enable you to get to know yourself better. Probably the best way is to have strong, open, and honest relationships with your colleagues so you all develop together. But having these kinds of relationships isn’t easy – it takes trust. The Johari Window is a tool which helps build trust amongst a team, and at the same time helps you to understand yourself and your peers better. 360 degree feedback: where you regularly (perhaps every 6 months) receive feedback on your perceived strengths and weaknesses from colleagues, both above you and below you the the organization, representing the 360 degree viewpoint. The idea is to then take this feedback and use it to help your professional development. Myers-Briggs Type Indicator (MBTI): is a self-assessment allowing you to assess your own psychological preferences, such as whether your prefer thinking in terms of the big picture or whether you prefer to see the facts and figures first. Again, this information can then used to for your professional development. One problem with both of these models is that whilst they obviously help you understand yourself better, they don’t build trust amongst your team. This is where the Johari Window comes in. The Johari Model was developed in 1955 by Joseph Luft and Harry Ingham from the University of California Los Angeles. The word “Johari” being a combination of both their first names, Joe and Harry. Firstly, that you build trust with others by revealing information about yourself. Secondly, that you can learn more about yourself by receiving feedback from others, and learning how they perceive you. This area represents things you know about yourself and which the group knows about you. It will contain information across multiple areas including, your experience, skills, viewpoints, attitude, personality, and feelings. This open area is one that we are very happy to talk about. It is important to realize that as we discuss things we know or that others know, that we are actually discussing perceptions. This means that others may perceive you to be a certain way but you may perceive yourself to be a different way. This concept of discussing perceptions applies to all quadrants of the model, not just the open area. It can be easy to think that the combination of our public and private selves is all that we are. However, how others view us may be different to how we view ourselves. This area represents those things that others know about you of which you are unaware. There are a number of reasons why others know things about us but don’t tell us. Perhaps they are worried about hurting our feelings, or perhaps they have tried to tell us what they know but we are so blind that we flatly assume that they are wrong. Particularly relevant to a professional context, someone may withhold information from us as it gives them power over us. This area represents things that you know about yourself but that the group doesn’t know about you. What we share with some people will differ from what we share with others, and will be based on the relationship and trust we have with the other party. For example, we’ll share more of ourselves with our spouse than with our work colleagues. Why we choose to keep certain information private could be because we find it embarrassing, or it could be because it would make us feel uncomfortably vulnerable. This area represents things that are unknown by both you and the group. This might include a natural talent for something you have yet to discover. It could include talents in the workplace that you haven’t discovered yet through lack of opportunity, confidence, or training. 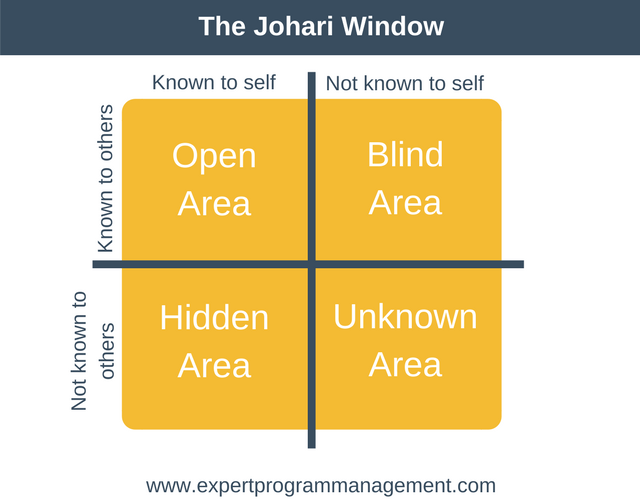 Although the Johari Window may seem complex it is actually very easy to use. What we should be looking to do when using the model is increase the size of the Open Area for both ourselves and our team members. An alternative way to say this is that we should be looking to reduce the size of the Blind Area, Hidden Area, and Unknown Area. In general it can be said that people who have a larger open area relative to others are easier to talk to and work with, because people trust them. Conversely, people will a relatively small Open Area are more difficult to talk to and more difficult to work with, as they seem guarded. In a group context, a team that understands each other will perform closer to their maximum potential due to the shared respect members have for each other. This is where you tell your team something about yourself that you think they don’t already know. For example, perhaps you love working as part of a small team but you get anxious when asked to work as part of a large group. With self-disclosure it is important to strike the right balance. You want to tell the group some currently personal information, but not personal information which should be kept private. As can be seen in the above diagram when we disclose information about ourselves the line between the Open Area and the Hidden Area moves down as our Open Area grows and our Hidden Area gets smaller. Note that organization culture and office atmosphere will hugely impact people’s willingness to share information about themselves and you may need to start small. This is where the team tells you how they perceive you through feedback. 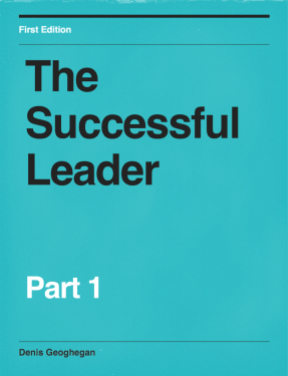 As an example, perhaps you perceive yourself as direct and to the point, but your team perceives you as curt. Just as with self-disclosure, it is important to strike the right balance when giving feedback, keeping feedback constructive. As we receive feedback from others and learn new things about ourself, the line between the Open Area and the Blind Area moves to the right, as our Open Area expands. Shared discovery can be a sensitive topic and may in fact not happen with the team, but with a third party such as a counsellor. Reducing the Unknown Area can lead to increases in any or all of the other areas, depending on what one does with this new information about themselves. This is the process of gaining insight into one’s own character and talents. When we use self-discovery we decreas out Unknown Area, but it is worth noting that we also increase our Hidden Area until such a time as we choose to disclose our new found information. Explain the Johari Window to the team. Explain that the goal is to increase the size of everyone’s open area, with the more that is shared the more trust is being built. Great teams built on trust aren’t created overnight, so it’s worth arranging multiple sessions to gradually build trust over time. On the first session start small, by asking everyone to share some small innocuous fact about themselves that others don’t know. Build from there in the next session. Remind people that they should only share information that they want to share, that isn’t damaging to their own reputation. Next, get everyone the opportunity to provide feedback to everyone else, one person at a time. Remind everyone that people can be very sensitive to negative feedback, so start slowly and keep it constructive. As an example of using the Johari Window in the real world, Mary decides to increase her Open Area by telling her team that she’d like to learn how to program, so as she could communicate better with developers. Upon hearing this, Jack shares that he’s been learning to program via an online learning tool, and he’d be happy to share his experiences with Mary. This constructive opening up builds trust across the whole team, and particularly between Jack and Mary as they now realize they have a shared interest. 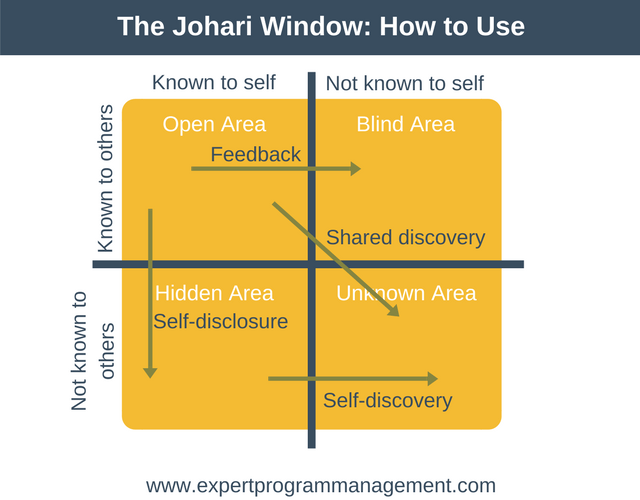 When you work through the Johari Window model it can be tempting to listen to feedback, acknowledge it, and then take no further action. A better approach is to think about where your general area of weakness is, and then come up with an action plan to address it. 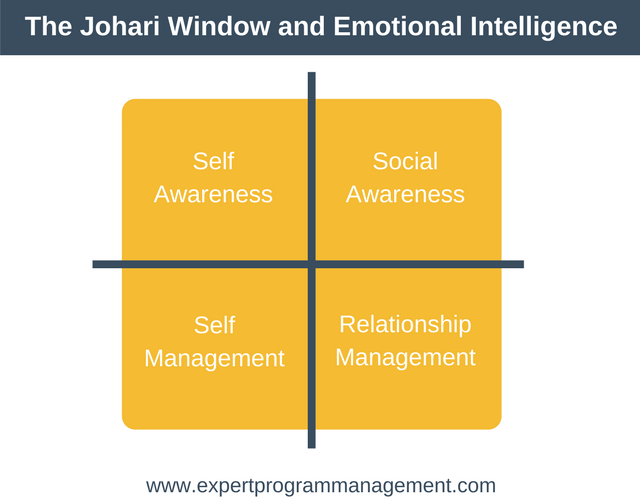 Mapping emotional intelligence (EQ) areas to the Johari Window can serve as a great guide in this respect. As an example, if you realize that you are guarded in nature with a large Hidden Area then you could take steps to improve you Self Management (also known as self-regulation), for example by working on your self-control, trustworthiness, or conscientiousness. Equally, if you discovered you have a large Blind Area, then you could look to improve your social skills, such as empathy, political awareness, communication skills, and cooperation skills. For more information about emotional intelligence you can read this article. The Johari Model was developed by Joseph Luft and Harry Ingham, with the word “Johari” being based on both of their first names, Joe and Harry. Using the Johari Model allows us to build trust between team members, and also allows us to better understand ourselves. When we use the model within a professional context we should be aiming to increase the size of the Open Area for each member of the team. Increasing the Open Area in this way builds trust within the team. By starting small and building over time, a very effective and collaborative team can be built with a high level of trust between team members.